Teenagers in Great Britain are being asked to take part in a study to learn if immunising them against meningitis B could protect them and other people. The NHS wants 24,000 to take part in the Oxford Vaccine Group's Be On The Team trial, which is helped by National Institute for Health Research funding. Bacteria at the back of the throat can cause meningitis and the study will see if vaccination can stop this happening. The trial will take place in four waves of recruitment over the next two years. Each of the teenagers who chooses to participate, in Year 12 in England or the equivalent in Scotland and Wales, will be put into one of three groups of 8,000 participants and will receive two doses of one of two vaccines. Two of these groups will be in the programme for a year, with the third, which will act as a control group, taking part for 18 months. The recruitment started this week and is planned to work around school holidays and exams, taking place in March-April and September-October this year and in 2019. 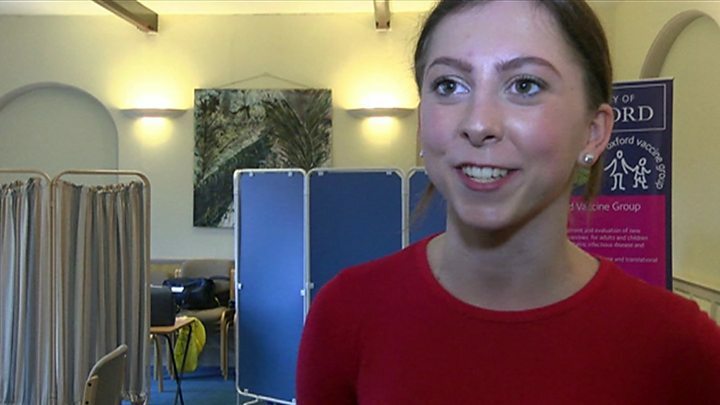 Dr Matthew Snape, a consultant paediatrician at the Oxford Vaccine Group, told the BBC: "We've had great enthusiasm from the schools we have approached, with the majority of Year 12 students interested in taking part. "The peak of carriage for the bacteria is from the teenage years through to young adulthood - there is a lot of carriage with university students. "We are doing the study to help us understand whether an immunisation campaign in teenagers would help us to protect the whole community." Dr Snape said the study's findings would be passed on to policymakers "to inform any future decisions about adolescent meningococcal immunisation". And there have already been calls for a wider meningitis B immunisation programme. Following the death of two-year-old Faye Burdett in 2016, a petition set up to ask for all children to be routinely vaccinated attracted 820,000 signatures. As a result, the government published a report last month explaining how it made decisions about which vaccines to fund. One of the report's recommendations was to lower the cost-effectiveness threshold for immunisation - widescale vaccination against meningitis B had been rejected as being "not cost effective". A consultation on the report is running until 21 May. Georgie Hall, whose six-year-old son died from the condition last October, told the BBC: "The government, I know, are saying that it's not cost effective to vaccinate more children against this disease. We really need the government to listen to the families." And Health Secretary Jeremy Hunt apologised for "system failures" that led to the deaths of two teenagers from the disease in Bristol in 2016. Claire Donovan, head of research and information at Meningitis Now, told the BBC: "We support the trial, and it's something we've been waiting to happen for a number of years - we are very keen that it goes ahead." Ms Donovan added that if the trial was successful, "then potentially vaccinating that age group will help protect the rest of the nation". Dr Tom Nutt, the charity's chief executive, said: "This important study is a chance for young people to make a real difference to not only their own health but that of their wider community."